Think of the satin skinned summer tomato, warm from the sun as it is plucked from the vine. Lick one side, sprinkle with salt and - that first bite, crimson juice running down your chin. Or asparagus, steamed, simmered, roasted, battered, grilled, sauteéd as an elegant welcome to Spring (even if it does make your urine smell odd.) Consider corn on the cob, picked while the pot of water comes to a boil on the stove. Shucked, briefly cooked, buttered, salted, and devoured as essence of summer. And then, there's cabbage. Pity the poor cabbage. It don't get no respect. I take that back. 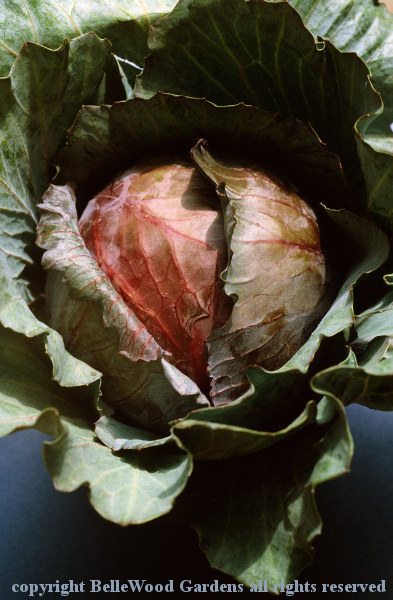 One day a year, on March 17th, cabbage is respected. St. Patrick's Day. Along with green beer (I'd rather have draft Guiness, thank you very much) it's corned beef brisket. And cabbage. Of course there's coleslaw, summer salad of raw cabbage. so there's making sauerkraut as a home activity. stuffed cabbage. Which includes sauerkraut. 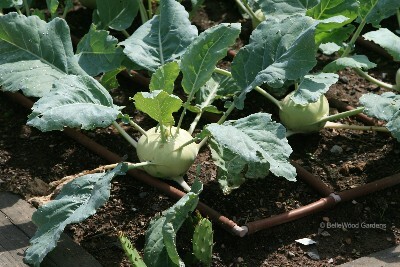 But this benign neglect, this casual ignoring of a lovely vegetable is about to change. How so? Because the National Garden Bureau has declared that 2017 is the Year of the Brassica. And brassica, as Wikipedia will inform you, is "a genus of plants in the mustard family, the Brassicaceae, the members of which are informally known as cruciferous vegetables, cabbages, or mustard plants. Crops from this genus are sometimes called cole crops, derived from the Latin caulis, denoting the stem or stalk of a plant." Cabbages, in all their tightly packed varieties: green, red, Savoy. Chinese cabbage. Loose leafy ones: kale and collards. 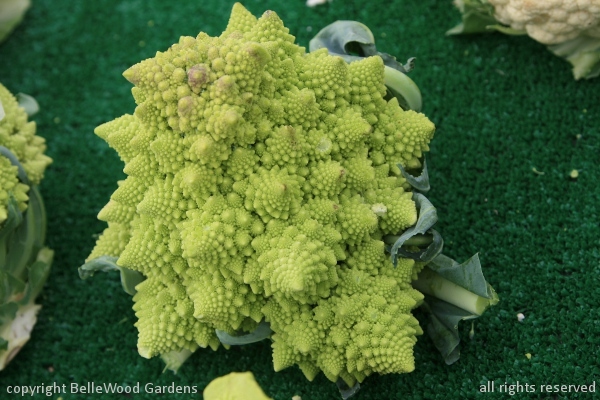 Broccoli, exotic romanesco broccoli, and cauliflower, the edible flowers. the roots: radishes and turnips and rutabaga. 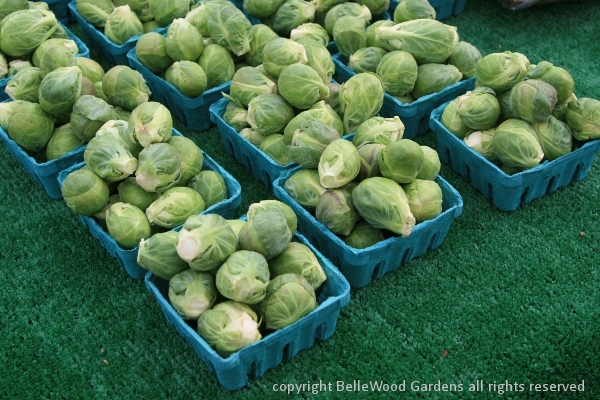 Back in the day before unseasonal produce came from abroad with frequent flyer miles, when "icebox" had a specific meaning connected with frozen water, back then and even earlier cabbage had terrific respect. 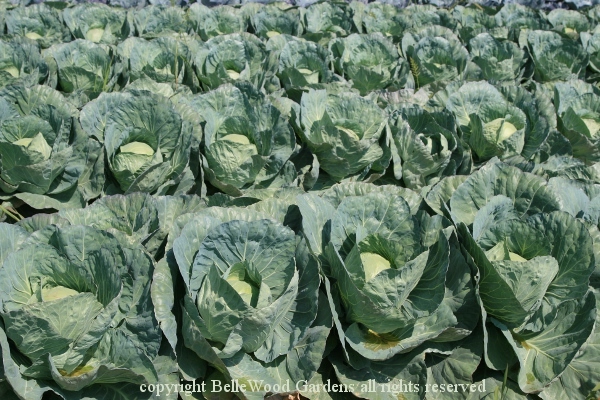 Late season cabbage varieties that may easily be stored for four to six months if kept cool made it a valuable resource. 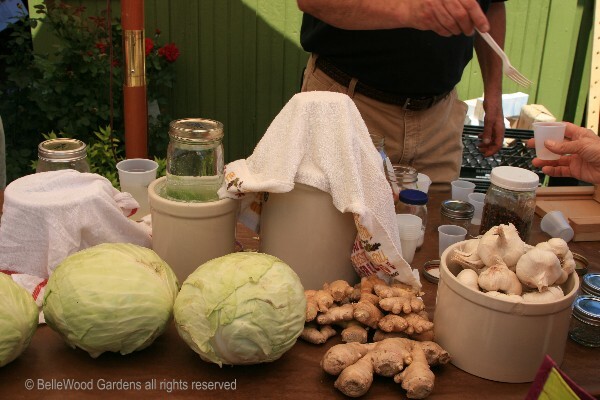 Let's consider a couple of simple traditional recipes for the humble cabbage. Darina Allen's Ballymaloe Cookery School in County Cork was a wonderful place that I visited a number of years ago and had lunch. 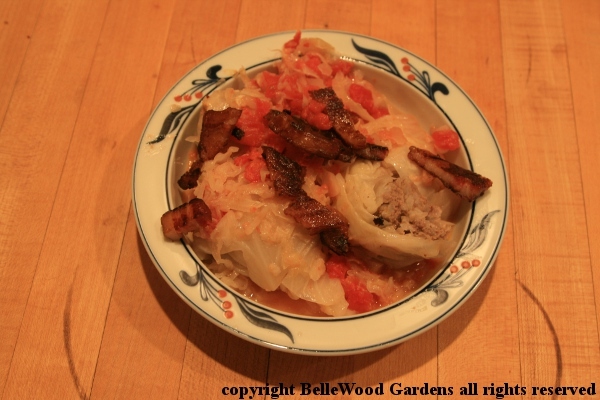 Her book, "Irish Traditional Cooking", offers recipes for boiled cabbage, buttered cabbage, bacon & cabbage, corned beef with cabbage, pig's head & cabbage. And colcannon. At its most basic: boil, peel, and then mash potatoes with hot milk. Add a similar volume of first shredded then cooked cabbage, and stir all together. Mound it on a plate, make a well in the center and add a lump of butter melting in the center. It's a good idea to make some extra and use to make a colcannon version of farls. To make farls - shape cold, leftover colcannon into a round flat shape, cut into quarters, and fry in bacon fat until nicely brown and crispy. Enjoy. And by the by, Dutch stamppot is rather similar, made from mashed potatoes and whatever. Kale (a brassica) is popular as is endive, cabbage is certainly an option, and my friend Carla once made it for me with leeks, when I was visiting her in Leiden. Braised red cabbage with apples and onions is a traditional German side dish to accompany pork, sausage, bacon. Melt bacon fat in a heavy pot and saute a diced onion for a few minutes. Peel, core, and dice a tart apple. Add to pot and continue cooking. Quarter a red cabbage, remove core, and shred crosswise. Saute, stirring to prevent scorching and also mix with apple and onion. Add a couple of bay leaves and some black peppercorns, cracked, also some caraway seeds if you like the flavor. Recipes usually call for 1 cup of red wine; I use red vermouth. Bring to a simmer and add 2 Tablespoons of red wine vinegar. Cover pot, turn heat to low and simmer gently for 2 hours. 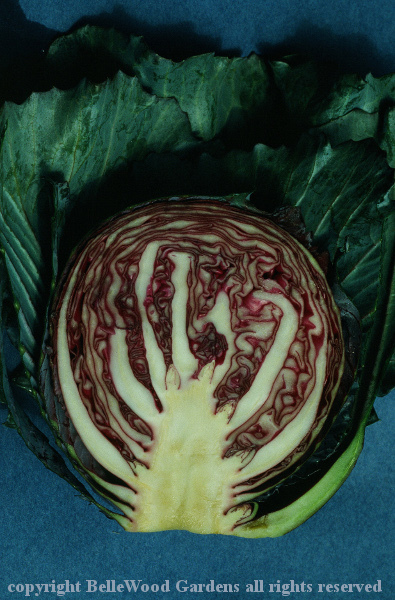 Check occasionally to be sure that cabbage does not stick to the bottom of the pot. In "The Finnish Cookbook" by Beatrice A. Ojakangas, Crown Publishers, New York, 1964, there's a recipe for punajuurikaalikeitto, a Finnish beet and cabbage, sort of borscht-like soup, made with beef broth, 3 large peeled and grated beets, and 1 small head of cabbage, shredded. It's seasoned with caraway seeds and peppercorns, served with sour cream and lemon slices. While the author doesn't specify I think using red cabbage would intensify the soup's color. And a good dark rye bread to accompany it . . .
Then there's an intriguing recipe for zjarinie piroshki s kapustoi, deep fried little pies with cabbage, in "The Art of Russian Cooking" by Nina Nicolaieff and Nancy Phelan, Doubleday & Company, Garden City, New York, 1969. Their recipe calls for shredded, boiled, drained cabbage fried in butter together with chopped onion. After this has been chilled mix in 2 chopped hard cooked eggs, some salt, pepper, and a little sugar. While all this is happening a yeast dough has been made and allowed to rise. When ready to complete the recipe the dough is patted out and cut into 3 to 3 1/2 inch circles. 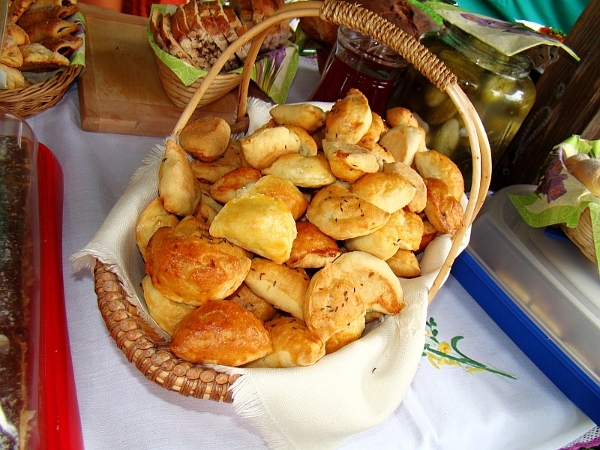 One tablespoon of filling is placed on each circle, folded over to make an egg shaped pie with the seam along the top. Rest for 10 minutes and deep fry in hot oil. Today our cabbage of choice would probably be the tender Savoy cabbage, and the filled parcels baked in an oven after brushing their tops with an egg wash.
Advance review copy provided by Artisan. Publication date May 2017. Recipe has been condensed for reasons of space. Excerpted from Six Seasons by Joshua McFadden (Artisan Books). Copyright © 2017. Photographs by Laura Dart and A.J. Meeker. Heat a glug of olive oil in a large skillet over medium heat. Add the mushrooms, season lightly with salt and pepper, and cook, stirring, until very soft and fragrant, about 8 minutes. Scoop the mushrooms out into a bowl. Add another 1 tablespoon oil to the skillet, add the leeks, season lightly with salt and pepper, and reduce the heat so that the leeks cook slowly. (If the leeks seem dry, you can cover the pan to capture the steam, which will help them soften up; add a spoonful of water if you need even more moisture.) Cook until they are fairly soft and fragrant, but not at all browned, about 3 minutes. Add 4 cups lightly packed finely shredded savoy cabbage (from a 1/2-pound chunk of cabbage) to the skillet, season with salt and pepper, and pour in 1/4 cup water. Cover the skillet and cook over medium heat until the cabbage has wilted, about 5 minutes. Uncover and cook the cabbage, tossing frequently, until it's very tender and starting to turn golden, another 8 minutes or so. Add 2 teaspoons balsamic vinegar, 2 teaspoons Worcestershire sauce, 2 teaspoons Dijon mustard, 1/2 cup freshly grated Parmigiano-Reggiano cheese, a big squeeze of lemon juice, and a shake of hot sauce and toss to combine. Taste and adjust the salt, pepper, hot sauce, or lemon juice until the mixture is highly savory and delicious. Let the filling cool completely, preferably in the refrigerator (you can't assemble the pies if the filling is warm). 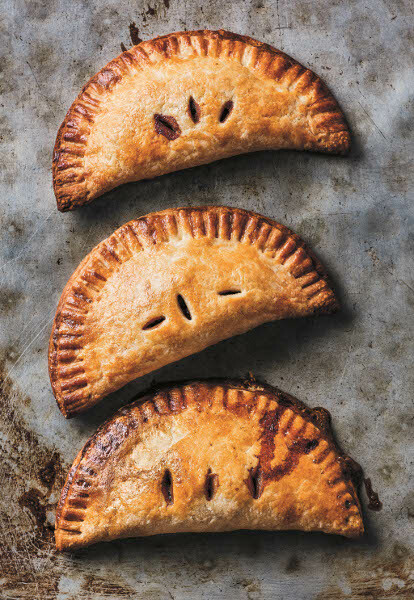 To assemble the hand pies, divide the Very Flaky Pastry dough into 8 pieces. Gently shape each piece into a round and flatten the round by pressing with your fingertips until you have a disk that's about 3 inches across. Dust lightly with flour and roll out to 7 inch diameter round. Scoop one-eighth of filling onto half of a dough round, leaving a border. Brush the border lightly with water using a pastry brush or your fingertips. Fold over the top half of the dough round, tucking it nicely around the filling, then press gently to seal the two layers of dough. Starting on one end, fold the edge over in small pleats, pressing firmly to seal. Work your way around the edge until the pie is fully sealed. Repeat with the rest of the dough and filling. Alternatively, crimp by pressing the edges with a fork. (If your kitchen is warm, pop the finished pies in the refrigerator as you work on the rest.) Chill for at least 30 minutes. When ready to bake, heat the oven to 375 degrees Fahrenheit. Cut three decorative slits into the top of each pie and arrange the pies on a heavy baking sheet. Bake until the pastry is an even, rich light brown (be sure to check the underside of the pies), 30 to 40 minutes. Some juices from the filling may bubble through the seams or slits; that's fine. Let the pies cool on a rack and serve warm. don't you agree it deserves more respect?